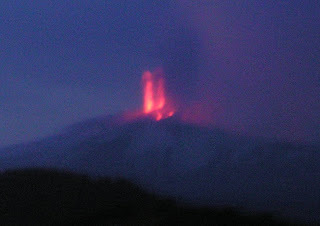 Sicilian Odyssey: Etna Fireworks Tonight! A couple of smallish earthquakes and lots of steam during the past week should have given us warning that this was going to happen. First, Christine and Matt called me, I called Jacque and Rob, Darcy called them, and we all had a pajama/photo party on their patio. Then Pat called me, Matt called Phil, and even all the Italians were out watching it! Here's the view from Jacque and Rob's patio (my neighbors) tonight of Mt. Etna. I don't have the world's greatest camera, but you can get the idea. We're at 3,000 feet and the peak is about 10,000 feet. You can hear it booming and also smell it--sulphury and smoky. View two short videos in the news of this eruption from Canada and Australia. Oh my....but, I like the pictures. I am so jealous! I could hear the explosions and rumbling, but alas, the mountain was under heavy cloud cover on my side so I could see NOTHING. 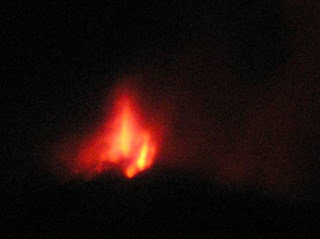 It is somewhat clearer now (4:49 am) and my side is loaded with lava. Tried to get a picture but it is still subdued enough that it does not show up. The Earth moved . . .